Golding Bird (December 9, 1814 in Norfolk, England – October 27, 1854 in Tunbridge Wells) was a British medical doctor. Bird was educated at a private school in London. He apprenticed in a pharmacy. He became a great authority in kidney diseases. Golding Bird was a personality of the middle of the nineteenth century who successfully promoted electrotherapeutics at a time when it was struggling. 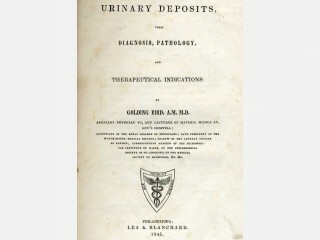 During his career, Bird was a physician of repute, lecturer in natural philosophy, electrotherapeutist, clinical chemist, frequent contributor to medical journals of London, restorer of the medical use of electricity from quacks, and wrote a notable monograph on urinary problems. England’s first electrical therapy department was established at Guy’s Hospital by Dr. Golding Bird in 1840. Golding Bird was born on 9 December 1814 in Norfolk, England, where his education began in the home of a clergyman, but continued at a private school in London. Although he learned some chemistry and botany in school, much of these subjects were learned through self study. His early interest in science guided him to an apprenticeship with William Pretty, a London apothecary, in 1829. In 1832 concurrent with his apothecary apprenticeship, Dr. Thomas Addison (1793-1860) (of Addison’s disease and pernicious anemia fame) encouraged Bird to begin the study of medicine at Guy’s Hospital. Bird then became a medical student at Guy’s Hospital with the patronage of Ashley Cooper, senior surgeon, and Thomas Addison, assistant physician. Great advances were being made in the field of electricity in the 1830s, yet electrotherapeutics in medicine was very limited. According to Morus, records of Guy’s Hospital indicated that too few patients were being treated by electrotherapeutics at that time so the treasurer approved the equipping of an electrical room with a senior physician overseeing a medical student, Golding Bird. This situation allowed Bird to receive valuable experience in electrotherapeutics as a medical student in preparation of his initial practice in electrotherapeutics that involved the use of the galvanic cell, the faradic coil, and static electricity. The electrical room at Guy’s Hospital was an experimental project where patients from the poor working classes in London were objects of these experiments. People of the poor working class at the time perceived hospitals as places to go to die and then be dissected. Medical appointees, even in electrotherapeutics and by student Bird, at hospitals were allowed a supply of charity patients to perfect their skills and try new forms of treatment. Many patients treated at Guy’s Hospital were selected because of their specific nerve disorders paralyses and involuntary motions of their limbs (chorea and hysterical paralysis). Numerous female patients were treated for irregular menstruation. Bird and his mentors used electrotherapeutics judiciously rather than as a panacea. By treating patients in a rational and controlled fashion, this group of electrotherapeutists at Guy’s Hospital avoided criticism and charges of empiricism from colleagues. As a consequence of this operational approach to electrotherapeutics, Dr Thomas Addison wrote in an issue of “Guy’s Hospital Reports” that he had underrated the effectiveness of electricity because of the vague recommendations and the poor manner in which it was applied previously. He stated that its past empirical and indiscriminate use by others was being regulated with rational applications at Guy’s Hospital. Electrotherapeutics was regarded as unsystematic and empirical in 1830. The electrotherapeutists of 1830 were promoting the use of electricity in their practices by social and rhetorical methods. To provide scientific support for their practices electrotherapeutists often associated their techniques with work of Grove and Faraday, and the electrophysiological findings of Matteucci. By the 1850’s, however, physicians and natural philosophers were beginning to work together for the mutual benefit of theory and technology. Both groups were using similar electrical machines in their respective work so that communication exchange often took place for mutual benefit. Although Bird is noted for promoting and using static electrical machines in his clinical treatments, he did conduct experiments with galvanic current as well. In one such experiment with albumen (protein in tissue serum) he observed that only the positive pole of galvanic current caused coagulation. After setting for awhile the albumen sample was then treated by the positive pole of his galvanic machine, and it took on an acid taste. When treated by the negative pole it had an alkaline taste. Bird, as a student and with the help of clerks, kept impressive lists of case histories on patients’ treated in the electrical room in support of electrotherapeutics, and reported them in “Guy’s Hospital Reports.” The detailed records of treated cases for the purpose of determining the value of electrotherapeutics. One such case history reported by Bird was a 15-year old female patient Jane Goulder, with hysterical paralysis of the left half of her body, who benefited from galvanic stimulation. She was admitted to the hospital six months after suffering an ankle injury, and then losing all muscle force (strength) in both of her lower extremities to become a paraplegic. After receiving two weeks of daily electrical shocks from her sacrum to toes, Dr Bird recorded that no signs of paralysis remained so the patient was discharged. The physicians involved with the Guy’s Hospital experience wanted to control the medical applications of electricity and to bring them within orthodox medical practice. Electrotherapeutics was not commonly the first choice for treating patients with paralyses. They were usually treated first with sulfate of zinc, the leading antispasmodic drug. When electricity was applied as treatment at Guy’s Hospital both outpatients and inpatients received it on a daily basis at three o’clock in the afternoon. Electrical treatments were given until symptoms disappeared. Measurement of the success for the treatment and for discharging the patient was often based on the cessation of involuntary motions and resumption of normal menstruation. Bird applied the electrical bath to patients treated in the electrical room of Guy’s Hospital. The technique of the electrical bath was to apply either positive or negative friction electricity to a patient who was seated on an insulated stool (often wooden) and connected to the prime conductor of the machine. The patient’s entire body is then electrified or charged with positive electricity (as predetermined), while the surrounding air is made negatively. The air carries off the electrical charge from all parts of the body gradually over several minutes. The electrical charging of the body and discharging by air over time constitutes the bath. The process was often repeated over one half of an hour. Frictional electricity was more or less abandoned after the discovery of the pile in 1800 and induction in 1831. The exception to the use of frictional electricity was Guy’s Hospital under supervision of Drs Bird and Gull. Dr Clemens of Frankfort, Germany, also was a staunch supporter and user of frictional electricity at the time. As a medical student, Bird read about Michael Faraday’s 1831discovery of electrical induction and the establishing of its principles. He soon had available to him one of the earliest faradic electrical machines constructed so that he could conduct clinical trials with it on his patients. Not long after starting his clinical trials with faradic current he wrote a letter to a friend in which he expressed some doubt about its effectiveness. He thought that Faraday had planted a weed that he would later have to pull up. Some time later after many clinical trials with electrical induction he announced that it had possibilities in the treatment of patients. After passing the examinations at Apothecaries’ Hall with honors Bird became a licensed apothecary in 1836. Concurrent with his experiences in the electrical room he was also appointed a junior lecturer in the medical program for natural philosophy and medical botany. Using his chemistry background, he published papers dealing with chemical analysis of blood and urine. In 1837, he used galvanic current to decompose the chlorides of ammonium, potassium, and sodium. He then deposited the metals of those compounds on a negative pole of mercury. Like many early discoveries the realization of their value was unknown, but later the industries of electroplating and electrotyping were developed on information that Bird uncovered. He joined the London Electrical Society, founded by William Sturgeon, in 1837. Bird not only learned technological aspects of electrical equipment, but as a member of the Society he had access to various kinds of electrical devices. He had access to static electrical machines, Leyden jars, galvanic machines powered by either a battery or another electrical machine, and faradic machines. After receiving his medical degree from St Andrews University in 1838, and a Master of Arts degree in 1840 he became physician to the Finsbury Dispensary where he stayed until 1843. During these years, he lectured at the Aldersgate Medical School. The Royal College of Physicians licensed him in 1840, and in 1846 made him a Fellow. In 1838, Bird tried an induction coil unit with a magnetic contact breaker for medical treatments because it did not require manual labor to generate the current like static machines. In 1839, he published his “Elements of Natural Philosophy”. Then in 1841, he published a report on the value of electricity in medicine. In his report he indicated that electricity was delivered from an electrical machine as current and sparks, from a Leyden jar as shocks, and from an electromagnetic device as shocks. In the same report he presented cases treated by electrical devices in the electrical department of Guy’s Hospital from October 1836 through December 1840. Successful cases reported from using these electrical devices included amenorrhea (absence of menstruation), chorea, hysterical paralysis, paralysis from lead poisoning, and rheumatic paralysis. He also indicated that electricity had a decided influence on cases of chorea, in spite of patient symptoms increasing initially because of timidity and novelty of the treatment. He claimed cure or relief in 35 of 36 patients with chorea. He could not support the use of electrical treatments for epilepsy, ovarian dropsy, and paralysis from brain lesions. In 1842, he described a condition having abnormal quantities of oxalic acid and oxalates in the urine that then became known as Bird’s disease. He also devised a flexible stethoscope. In that same year he found time for marriage, and subsequently he and his wife had five children. He was appointed an assistant physician at Guy’s Hospital in 1843, and continued to engage in thorough investigations of different forms of electricity in medicine. He suggested that galvanism be used as an electrical moxa for chronic indolent ulcers. Bird introduced electrical moxa. He used electrical moxa as a form of counter irritation, for the purpose of masking pain by diverting it to another part of the body. In his moxa the local application of galvanic current was applied to the skin over the area of the body where the patient was having pain. The galvanic current was applied long enough to form a blister underneath each electrode (by the polar chemical effects). A piece of zinc foil was then applied over one blister and a piece of silver was applied over the other blister. The metals were embedded in plaster, and then connected by copper wire to serve as electrodes in the electrical galvanic circuit that was then applied for hours. When the electrodes were removed following the galvanic current treatment the skin where the galvanic current was applied appeared whitish from the action of the nitrate of silver. In 48 hours an eschar (slough) was produced on the skin which began to separate in four or five days. The eschar was produced by the chemical action of continuous current, in consequence the blister was decomposed, and sodium was set free at the silver plate electrode. At the zinc plate, oxidation rapidly became soda, and chlorine was evolved to form chloride of zinc. In the treatment of pain previous moxa techniques burned the site of pain to form a counter irritation which was a form of cautery used later in medicine. Bird thought electrical moxa was suitable for application over most parts of the body that had pain. The chloride of zinc, originated by electrochemical action, produced a sore, which freely discharged pus if a common poultice was not applied. While the process was taking place, patients hardly ever complained of pain because caustic action works in infinitely small portions on the skin. Although the moxa produced secondary mal effects, the treatment was used to combat pain in the 1840s. Bird did not like the blistering of the skin by galvanic current in preparation of the electrical treatment of pain, but he considered the electrical treatment better than using heat. He also used his moxa as a treatment of indolent (pain free) wounds. In the treatment of indolent wounds by electrical moxa, zinc and silver plates were connected to a galvanic machine. Under the zinc plate zinc oxychloride formed to cause a deep slough that was then believed to hasten healing. Moistening the skin with salt water was usually done in preparation for the treatment in order to reduce impedance underneath the silver plate. Bird published a paper in 1846 “On the employment of electro-magnet currents in the treatment of paralysis” reporting patient cases that were treated with an induction coil having a hammer break made by Neeves, the London instrument maker. In his paper he claimed that facial and limb paralysis resulting after exposure to cold or exhaustion, and partial paralysis from congestion or cerebral causes could be successfully treated by electrotherapeutics. Presenting case studies in published clinical papers to support electrotherapeutic experiences was a common practice of the time, and Bird readily used this approach to promote the field and the electrical department of Guy’s hospital. His reported cases included persons with paraplegia who constantly endured excessive fatigue, women in industry who worked 16 to 18 hours per day doing needlework, and a physician who spent many hours bent forward while using a microscope. According to Licht both Golding Bird and Christian Neef claimed credit for adding the primary coil circuit breaker (interrupter), and Heinrich Ruhmkorff designed the inductorium in 1851. Hackmann traced the idea of the hammer break of the interrupter to Alexander Kemp of Edinburg, Scotland, and to William Neeves of London (Neeves built the faradic machine for Bird). Both Charles Page of the United States and Nicholas Callan of Ireland had invented induction coils by 1838 prior to that of Ruhmkorff. Ruhmkorff did revolutionize the coil design in 1851 that led to making it practical for medical use. An excerpt from the Medical Gazette of London was published in an 1847 issue of Lancet (p. 677) calling attention to a newly observed phenomenon when using the electrical moxa of Dr Bird. Ordinarily, when the electrical current was applied to the metal electrodes placed near each other the subjacent muscles contracted, especially when the patient was going to sleep. Annoyed by this the patient often disconnected the connecting wires to the galvanic battery. If the electrodes were placed on opposite limbs or on either side of the mesial line (middle) when on the chest no muscle contractions were observed, and the treatment continued without annoying the patient while sleeping. Being made a Fellow of the Royal Society in 1846, he then became a lecturer in medicine at the College of Physicians from 1847. Dr. Bird became a member of the Linnean Society, and the Geological Society. He authored many articles other than those cited, some were: “Elements of Natural Philosophy” in 1839, “Urinary Deposits…..” in 1844, “Lectures on Electricity and Galvanism in their Physiological and Therapeutic Relations” in 1849 (lectures of 1847), and “Medical Treatises.” Bird also provided the state-of-the-art electrotherapeutics in his paper by stating that it had not received fair trials as a therapeutic agent. He claimed that electricity was frequently applied by medical practitioners to hopeless cases and administered indiscriminately without regards to the manner, form, or mode of treatment. Since he believed it was valuable in medical practice, he urged all physicians to use it rationally. Bird believed that electricity would succeed in medicine because of those practitioners using it correctly and successfully. On the other hand he discouraged physicians from using electrical treatments if they were inadequately trained in the physical sciences and were unable to apply electrical treatments themselves. He indicated that because medical practitioners were not using electrotherapeutics regularly in their practices quacks and medical galvanists were taking advantage of the situation to operate in London at the time. In 1847, Bird gave a series of lectures entitled “On electricity and galvanism in relation to physiology and therapeutics” to the Royal College of Physicians. His lectures helped to advance recognition of electrotherapeutics by the medical profession. He told his audience that electrotherapeutics was ineffective for treating amaurosis (partial or total loss of sight) and deafness. In his final lecture Bird summarized the cases treated by electrotherapeutics at Guy’s Hospital during his tenure. His lectures and publications were well received by the members, seemed to renew interest in electrotherapeutics in England during the 1830’s and 1840’s. Bird published his lectures as a book in 1849 in which he reviewed the state-of-the-art electrical methods as well as his own patient experiences with electrical treatments at Guy’s Hospital. He was aware that faradism had been used by skillful obstetricians in cases of uterine inertia and the control of postpartum hemorrhage, but that a famous Scotch obstetrician viewed electrical treatments with skepticism. In spite of the mixed reports Dr. Golding Bird published the results of treating amenorrhea using the Leyden jar (static electricity) in 1847. He also indicated that he had never observed successful electrical treatments of paralysis accompanied with severe contractures. Bird advocated the use of static sparks in lead palsy, and a variety of electrical approaches for the treatment of amenorrhea, catalepsy, chorea, hysteria, and tonsillitis. He encouraged the use of static electricity and electromagnetic devices as preferred approaches to general treatments of inducing uterine contractions, treating neuralgic pain as a counter irritant, and maintaining wakefulness in patients who overdosed with opium. In 1849, Bird developed rheumatic heart disease that then interfered and robbed him of potential achievements in medical practice. Bird had been elected to the French College of Physicians in 1845, and as a Fellow of the Royal Society in 1846. Dr. Golding Bird has been given credit for providing some of the best descriptions in electrotherapeutics involving Faraday’s induced current. Some say that he was the founder of electrotherapeutics because of his contribution to the practice by promoting it in a contemporary form that was acceptable to the medical profession. Dr Golding Bird’s notoriety and lecture contents also caused him some displeasure. The Galvanic Pulvermacher Company apparently used contents from Bird’s lectures and publications to assign claims and endorsements to him for marketing the Pulvermacher electrical belts and later the Harness electrical belt. These electrical belts became a very popular and profitable form of quackery that took advantage of a naive public during the nineteenth century. The electrical belts consisted of metal discs mounted like a chain belt along the plan of Dr Bird’s electric moxa. Not only did the public like wearing the belts, but surprisingly such notable physicians of the time as Sir Richard Quain and Sir Andrew Clark endorsed the belts. Their testimonials about the efficacy of the electrical belts gave the quacks creditability with the public, but in reality revealed their own ignorance of electricity. Sometime around 1840 Golding Bird tested one of the Pulvermacher devices to determine its validity, and found that it was capable of generating a very small amount of electrical current. He, however, did not think that sufficient current was generated in the belt to produce any physiological effect. Perspiration from the body was even found to activate the device and maintain its operation. Upon reading Bird’s test report the director, Meinig of the Pulvermacher Company in England quickly used it as an endorsement of his product, and included Bird’s name in the company’s advertisements. A series of caustic letters were exchanged between Bird and Meinig over the use of Bird’s name, and especially the endorsement. In spite of the exchange of letters between the two individuals Bird’s name continued to appear in Pulvermacher advertisements even after the dispute was aired in The Lancet (a leading English medical journal). Bird’s name, however, was only one of a number of names of distinguished English and foreign dignitaries used to help sell the Pulvermacher belt. The Pulvermacher Galvanic Company of London and of the United States were very successful manufacturers of quack electrical devices. Bird, like other physicians, wanted a large and successful medical practice. A good reputation in science was helpful to his career which developed nicely. He had gained a favorable reputation in chemistry while a student by publishing, and was invited to discuss the chemistry of milk in “The Anatomy of the Breast” by Sir Ashley Cooper. He enjoyed an association with other electricians of London by joining the London Electrical Society. The Society’s meetings were a forum for members and others interested in electricity to present papers about their work. Names like Henry Letheby (forces of nerve and electricity), Alfred Smee (Smee battery), E.M. Clarke (new electromagnetic machine), William Leithead (battery), and Thomas Bailey (thermoelectrical battery) became associated with the Society. Bird once presented his instrument for applying electrotherapeutics more conveniently by breaking contact between an electrometer and the primary wire of an induction coil. Golding Bird remained in charge of the electrical department at Guy’s Hospital until 1854, one year before his premature death (aged 40 years) from complications of aortic regurgitation. Golding Bird was married 1842 and left a widow and five children. He died on 27 October 1854 at Turnbridge, Wells. View the full website biography of Golding Bird.